While supplies last, we are giving you one heck of a deal on the LION StationWear Fire Station Jacket in Navy Blue. If you're looking for a durable, multi-season jacket to wear in the cold, wind and rain, this may be the one for you. This sweet jacket is available to you for only $50, marked down from the original $125 price-tag, making this a $75 savings. For a jacket made with a ripstop nylon outer shell, a lining that's entirely waterproof and 100% nylon taffeta, with sleek, silver reflective piping, and nice slant style handwarmer pockets, this is one amazing promotional we're proud to extend to you. 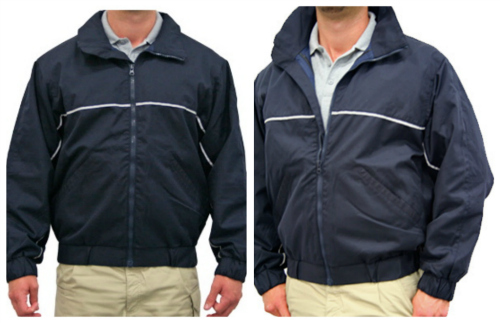 Ranging in size from XS-5XL, we'll be sure to have jackets that fit you and all your friends at the station. With the onset of Fall weather, be sure to stop on by and check out our amazing deal this week before it's too late. You'll love your Lion Stationwear jacket, we just know it. For more details and specific product information, click here.